But which pokemon is it? I NEED TO KNOW. 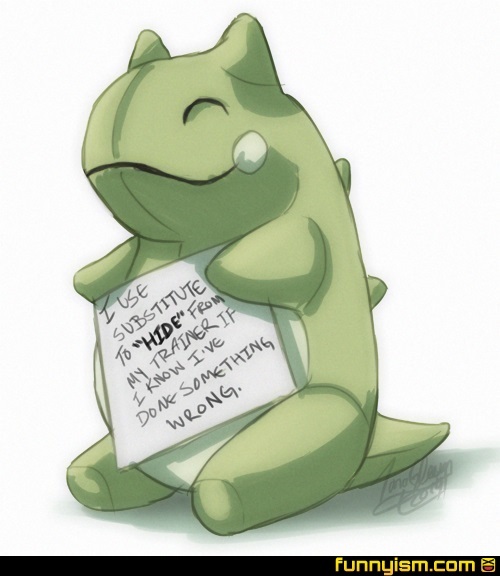 @GrimIock, well lets think this through,there aren't many pokemon who learn substitute naturally, mr. Mime family, kecleon, rotom, and the greninja family. It's likely one of those. Although most pokemon can learn it through TMs so I guess, there's no way to be certain. Although, we could compare the size of the substute doll to the sign, which is about the size of the pokemons torso. Of the pokemon who learn it naturally mime jr. Froakie, and rotom fit this size. Rotom are known for generally being little shlts so my money is on rotom. @fiddlesticks, And I thought I knew my shjt! That was beautiful! @Cococonnection1, upvote for you mister, you know your stuff! I remember playing Pokemon Stadium (1st gen) on the N64, and the substitute has always looked like that since then. @GrimIock, that's not a Pokemon technically. It's the substitute. Guys I have a confession, I never played Pokemon. @pinklipstick, that's cool. You can lime what you want. I personally loved it, but you might not. And The world goes round. Yeah. I feel you mean, *insert name of any pokemon that can learn susbtitute*. I feel you.